"The Elliott Centenary, 1829-1929, St. James' Church, Pictou, N.S." A 4-page brochure commemorating the arrival of the Reverend Charles Elliott at Pictou Town. Newspaper clipping from "The Evening News" 7 August 1980, page 9, describing the 100th birthday celebrations of Miss Mary Willis. "A Golden Wedding", a clipping from an unidentified and undated newspaper recounting the 50th wedding anniversary celebrations of Alexander Fitzpatrick and Mary Rae. 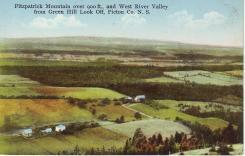 Fitzpatrick Mountain over 900 ft., and West River Valley from Green Hill Look Off, Pictou Co. N. S.
School teacher's license issued to Alexander Willis (1845-1934) of Mount Dalhousie on the day after his 17th birthday. Obituary of the Late Mrs. James Willis (Elizabeth Fitzpatrick) from an unidentified and undated newspaper. Newspaper obituary recording the death of Matthew Henry Fitzpatrick on 20 September 1905 in London, England. 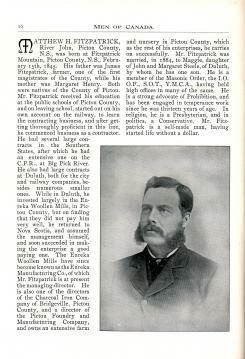 Biography of Matthew H. Fitzpatrick as published in "The Canada Album. 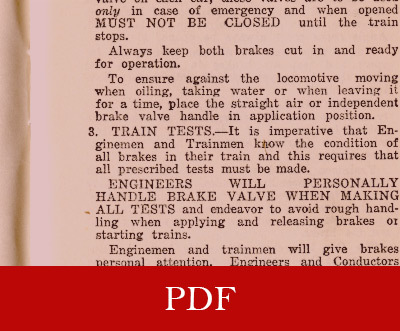 Men of Canada; or Success by Example", Volume IV, 1895. 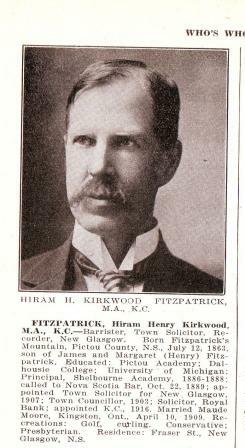 Biography of Hiram H. Kirkwood Fitzpatrick in "Who's Who and Why 1921". Rev. John R. Fitzpatrick obituary from an unidentified and undated newspaper.